Certified water operators are a crucial part of providing an adequate and safe supply of water. AWWA has publications, online tools and other resources needed to become to an operator. A certified operator is an individual that works to ensure safe water. Operators can work in various areas, such as water, wastewater, distribution and reuse. These operators maintain equipment and processes to monitor and affect water as it moves through the treatment and distribution cycles. Why Become a Certified Operator? The certified operator career is a very promising field. The US Bureau of Labor Statistics maintains that the average salary for water and wastewater treatment plant and system operators in 2015 was $44,790 USD per year. Becoming a certified operator also offers individuals the opportunity to make a difference in society on a daily basis. Clean and safe water is essential to everyday life. Operators have the ability to regularly impact that need. 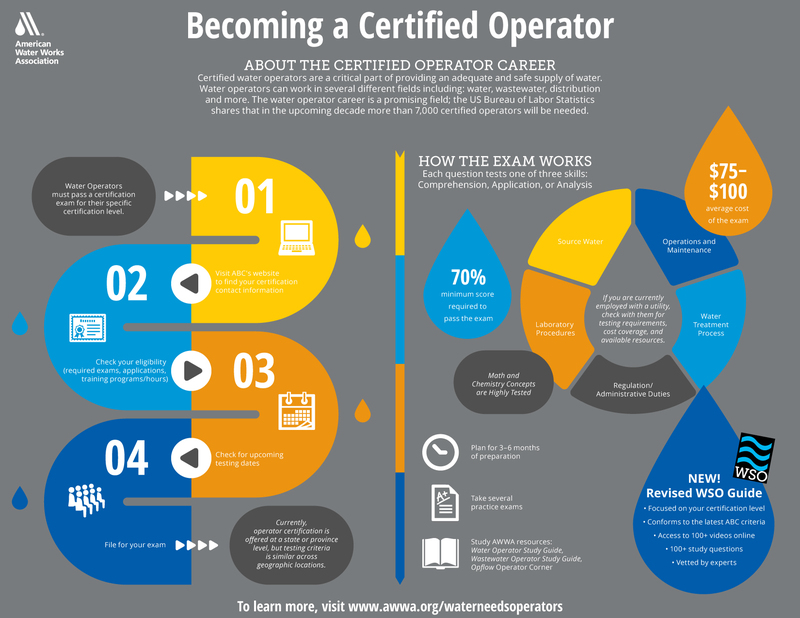 What Does it Take to be a Certified Operator? What are the Steps to Getting Certified? In some states, you need to pass a certification exam before you can be considered for an operator position. In others, you can get an operator job, but must pass the certification test within a set time frame after being hired. Refer to your state or province for more information about what is required. What is Required to Get a Job as an Operator? Utilities have different job requirements based on how large and complex their operations are and what the specific job duties are. Some positions may require a high school diploma, while others demand a stronger math and chemistry background, or an Associate’s or Undergraduate degree. Refer to the AWWA Career Center to see the requirements for jobs in your area. How Do I Get Certified as an Operator? Tests are fairly similar between states, although some states add or remove information based on local conditions or environmental/health requirements. The Association of Boards of Certification (ABC) has established need-to-know criteria for each certification area that is used for most tests in the United States. Make sure to verify that the testing agent in your state or province offers the certification you need. What is the Certification Exam Like? Certification tests cover topics such as chemistry, disinfection, biology, hydraulics, treatment techniques, measurement, and math calculations. The exams typically contain multiple choice questions. For questions that are similar to those on certification exams, you can look at the Opflow Certification Corner. What Resources Does AWWA have Once I Become Certified? AWWA has numerous resources for operators who wish to advance their career.